On 3 May 1695 a piece of legislation was allowed to lapse with consequences which could not be foreseen either by Parliament or the book trade. The Licensing Act had replaced other methods of controlling the press in 1662 and, although, as mentioned above, it had previously been allowed to lapse between 1679 and 1685, for more than thirty years it had had the effect of limiting printing to London, Oxford, Cambridge and York with only twenty printers being permitted in London itself plus the three royal patentees. By 1686, after the six years during which the Act had lapsed, this London total had grown to 55 printers with 145 presses still not an enormous number for the requirements of a nation of some six million souls. Within two weeks of the final lapse of the Act in 1695 four newspapers began publication in London, and almost in anticipation of the new freedom, the Corporation of Bristol decided that 'a printing house would be useful in several respects' and invited William Bonney from London. In the same year Thomas Jones also moved from London to the provinces, establishing a printing office in Shrewsbury. The following year Daniel Jordaine was paid for printing work by the Corporation of Plymouth but this does not seem to have led to an active press in that part of Devon. Such haste could have been ill-advised, as there were moves to reintroduce licencing of the press in the late 1690s. Much of the credit for ensuring that these moves were not successful must go to a Devonian, the deist writer Matthew Tindal, who was born in Bere Ferrers, probably in 1653. In his work An essay concerning the power of the magistrate and the rights of mankind, in matters of religion (London: Printed by J.D. for Andrew Bell, 1697) he argues in a postscript against giving the clergy the power of licensing the press. The next year he produced a 32-page pamphlet A letter to a member of Parliament, shewing, that a restraint on the press is inconsistent with the Protestant religion and dangerous to the liberties of the nation. It has been held (Sirluck 1960) that the content of this tract was taken almost entirely from Milton's Areopagitica without any acknowledgment. Nevertheless it served its purpose and the spread of provincial printing could continue. Exeter was probably the next English provincial town to attract a printer. In 1697 there were at least three booksellers in Exeter, John Pearce, Charles Yeo and Philip Bishop and reports of an active book trade there brought Samuel Darker from his London office in 1698 to establish Exeter's first permanent printing office. Darker had previously worked in Bull's Head Court in the parish of St. Giles Cripplegate in London where he is recorded in 1695, and a number of London imprints can be ascribed to him (Maxted 1991a). He was born in about 1665, the son of Samuel Darker of London, fishmonger and was apprenticed to Robert Roberts, citizen and stationer in 1679, becoming a freemen of the Stationers' Company in 1686. He married in 1685 and several children are recorded including one, John, who was apprenticed to Samuel's widow and later became a master printer in London, binding his own apprentice in 1710. Samuel's career in Exeter was a short one. He died in March 1700 in London of stopping of the stomach and was buried in St. Giles Cripplegate. There was no will, his widow swore to administer his estate at the London Court of Orphans. An inventory dated 23 September 1700 includes two presses. He does not seem therefore to have relinquished his London business and never took out the freedom of Exeter. The arrival of a printer brought a new dimension to the book trade in Exeter although this dimension was not to be found in the traditional area of the publication of books and pamphlets. In fact surviving numbers of books and pamphlets with Exeter imprints rarely run into double figures in any year before 1800, five items a year being more typical, less than one per cent of the London output. Thus the local press scarcely furnished a new medium of expression for a vast untapped reservoir of local talent. Of six authors whose works were printed in Exeter between 1698 and 1700 all had previously found London printers for their works, sometimes with local booksellers included in the imprints, and three had work printed in London after 1700. Offspring Blackall, Bishop of Exeter from 1708 to 1716 had over twenty editions printed in London in 1708 and 1709 but only one in Exeter itself. It was the twin elements of the newspaper and jobbing printing which constituted the new dimension that the printing presses brought to the provinces. 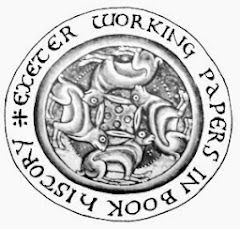 Jobbing work and the printing of ephemeral material will be dealt with later but it is significant that of the seven printers supplying apprenticeship indentures in Exeter to 1730 no fewer than six also published newspapers. The first of these was Samuel Farley. We have seen that Darker's career in Exeter was short and although it was cut short by his death, he may never have intended to give up his London printing office. His Exeter business seems to have been largely run by Samuel Farley whom he had taken as partner in 1698, within a year of setting up in Exeter. Farley's origins are uncertain. There are no references to the family in Exeter parish registers of the seventeenth century or in transcribed inhabitant lists. He is probably identical with the Samuel Farlow, son of Edward of Twining in Gloucesteshire, yeoman, who was apprenticed to Freeman Collins citizen and Stationer of London on 6 May 1689. We have seen that Collins had a number of links with Exeter and, after Farley had served his time and took out freedom of the Stationers; Company on 4 September 1699 it was probably he who recommended him to Darker as a suitable assistant. He continued Darker's business after his death in 1700. It was quite an ambitious printing office with a steady flow of titles including several large-scale works, notably John Prince's Danmonii orientales illustres, a biographical dictionary of eminent Devonians which will be discussed later. But such works were a long time in gestation and arrived at the office at unreliable intervals, so some more regular occupation for his printing presses was required. Thus it is that Exeter vies with Bristol and Norwich for the honour of having the earliest English provincial newspaper. Counting backward from issue 556 of 10 August 1711, the only surviving issue of Sam. Farley's Exeter post-man we reach December 1700 as the date of the first issue, preceding the Norwich post by almost one year and the Bristol postboy by almost two, although this does assume that the Exeter paper appeared only once a week. It is more likely from other evidence that it was in about 1704 Samuel Farley established the Exeter post-man. From 1705 to 1707 he took as partner Joseph Bliss who in 1709 set up a rival newspaper, the Exeter post-boy. From that date there were probably always at least two competing newspapers in Exeter and any newspaper in Exeter from the 1730s had keen competition from the Sherborne mercury. In fact, the Devon newspaper press went on to produce many more titles than the average county, with at least 260 different titles represented by over 350 significantly different changes of name up to 1988 being listed in the Devon section of the Bibliograpy of British newspapers. Farley continued to publish his newspaper in competition with his former partner Joseph Bliss but he had ambitions outside Exeter. In 1713 his issued the first number of Sam. Farley's Bristol post-man. With the assistance of the Exeter bookseller Philip Bishop he maintained his Exeter office for another two years, starting a new title the Exeter mercury on 24 September 1714. On 30 September 1715 he gave details in his Exeter paper of an agreement whereby henceforth he should print the news in Exeter. This was just three days after the first issue of Farley's Salisbury post-man. Farley appears to have overstretched himself in this latest venture as the title did not survive for long and he concentrated his activities in Bristol, although the family reappears in Exeter in the 1720s. Much of the content of these early newspapers was copied from their London counterparts and from manuscript newsletters, and they were financed by local advertisements and those for selected London businesses, especially booksellers and patent medicine manufacturers. While there is no record of Samuel Farley having encountered problems with the authorities in Exeter, life for the provincial newspaper printer was not without its risks as the careers of his successors show only too clearly. Philip Bishop was succeeded by his son George who took over publication of the Exeter mercury. In November 1718 he too landed himself in trouble with the authorities for publishing an account of the proceedings of the House of Commons, an action which was held to infringe Parliamentary privilege. On 4 December he was summoned to appear before the House and presented himself before Parliament on 19 December. The next day he was heard at the bar of the House, where he expressed his great sorrow and asked forgiveness "having a Wife and Family to provide for in the country, his Affairs will suffer very much by his Absence". While upon his knees he received a reprimand and was discharged from custody, paying his fees. Ironically Bishop's adversary Joseph Bliss was summoned at the same time for the same offence. He did not attend personally but on 14 January wrote a letter in which he "prayed that the House would not proceed any further against him; which if they did, it would end in the Ruin of himself and his Children, he being wholly void of Friends and Money, and in no Condition to make Satisfaction for any Part of his Fees." He was ordered to be discharged of this commitment. That he got off so lightly was probably owing to his strong anti-Jacobite tendencies. There was a third Exeter printer accused at the same time, Andrew Brice, a former apprentice of Joseph Bliss who had absconded and who started the Postmaster during 1717. On 28 November 1718 he too had printed the Resolutions and Proceeding of the House of Commons. On 19 December he was summoned to attend the House on 14 January on which day he presented himself at the bar. He admitted the offence, claiming that "he had Intelligence from News-Letters sent to Coffee-Houses at Exeter". It was not until 1771 that Parliament ceased to insist on its privilege and publishers became free to report the proceedings of the nation's governing body. For a number of years prior to that date Samuel Johnson had earned his living editing for the Gentleman's magazine the account of the debates in the senate of Lillputia, a thinly disguised report of the proceedings in the House of Commons. Samuel Farley or his son, also named Samuel, returned to Exeter to establish Farley's Exeter Journal in May 1723. Another son, Edward, took over the newspaper by 20 May 1726. Edward's career as a newspaper printer proved to be short-lived and disastrous. He soon incurred the hatred of Andrew Brice, the printer of Brice's Weekly Journal. A quarrel, probably fuelled by Farley's Jacobitism, was carried on with acrimony and coarseness (Brushfield 1888, 183). Brice summed it up in the issue of his Journal dated 13 January 1727: "I have found no other Cause to love any of the Farleys besides the positive Command of loving my Enemies". In August 1728 he challenged Farley to reprint an article known as the Persian Letter which had appeared in Mist's Weekly Journal on 24 August. Nathaniel Mist had launched his Weekly Journal or Saturday Post from his premises in Great Carter Lane on 15 December 1716 and it rapidly became the organ of the Jacobites and "high flyers". Daniel Defoe was a regular contributor. Mist had been in trouble on a number of occasions for his criticism of the King, had stood in the pillory in 1721, and he had been imprisoned more than once. Nathaniel Mist had fled to Rouen in January 1728, and had managed to publish his paper from the safety of France with the help of friends. On 24 August 1728 a libel on the King, couched in the form of a Persian allegory, appeared in his paper. This lead to the arrest of more than twenty people connected with the publication and the destruction of his press on the orders of the government. After his press was destroyed in September 1728 he launched the first issue of Fog's Weekly Journal and in it Mist, in a signed article wrote: "Dear Cousin Fog, The Occasion of my present Address to you is to acquaint you, that I was lately seiz'd with an Apoplectic Fit, of which I instantly died ...". But before all this had happened the hapless Farley had taken up Brice's challenge, reprinting the article in issue 276 of his Exeter Journal, dated 30 August 1728. He was promptly arrested, put in irons and cast into Exeter Gaol. At the October quarter sessions and gaol delivery two presentments were made against him by the Grand Jury both of Devon and Exeter for having printed the article, describing his action as "an infamous, scandalous and treasonable Libel, calculated to poison the Minds of His Majesty's Subjects with groundless jealousies to sow Sedition and overturn the Peace of this Kingdom, and in favour of a spurious, abandon'd, and abjured Pretender." The person actually responsible for setting the text of the "Persian Letter" from the Jacobite newspaper Mist's weekly journal of 24 August was one Richard Stretchley who was born in St Petrock in 1701 and matriculated at Balliol College, Oxford in 1718 but had not graduated. The solicitor for the Crown William Gill said of him "his parents left him with a handsome fortune wch he has profusely and extravagantly spent, and he, having had some university learning, became Farley's compositor of his press for bread". Farley claimed that he had "inadvertently suffered the same to be reprinted in his newspaper without reading or being acquainted with the contents thereof". Brice triumphantly printed the presentments at length in Brice's Weekly Journal for 18 October 1728. For a time Farley was held in Newgate but was returned to Exeter in time for his trial which opened on 31 March 1729. A remand was obtained on the grounds that the copy of the indictment given to Farley in court did not tally with the original record. In July the case was resumed but only two witnesses could be found for the Crown, one a man of bad character and the other Farley's son-in-law, who would only speak on compulsion. The Attorney-General recommended that the prosecution should not proceed and an order was made for Farley's release. This came too late for the unfortunate Farley as on 24 May it had been reported that he had died in prison a few days previously. On 19 June Robert Knell, the compositor of Mist's Weekly Journal and John Clark, the pressman, were set in the pillory for their work on the issue of 24 August 1728 (Timperley 1842, 640). Fog's weekly journal continued Mist's opposition to the government until his death from asthma on 20 September 1737. Farley's newspaper was continued until at least 8 November 1728, perhaps conducted by other members of the numerous Farley printing clan. There is evidence in the Courtenay family papers that a newspaper was printed in Exeter by members of the Farley family throughout the 1730s although no issues survive In 1754 another member of the Farley family, named Mark Farley was sentenced to one year's imprisonment in Exeter for printing a seditious song on he anniversary of the Pretender's birthday, so Jacobite sympathies appear to have lingered on in the family. To survive, these newspapers had to regularise the links with London, links which could also be used as general channels of communication for the book trades. Firstly they required a regular supply of newspapers or manuscript newsletters to provide copy for their columns. The post in the early eighteenth century normally left London every Tuesday, Thursday and Saturday night. Andrew Brice published his Weekly journal on a Friday and in his issue for 31 October 1729 he noted that he had received the post which left London on the night of Thursday 23 on the night of Saturday 25. The post which left on Sunday, probably early in the day, arrived on the Monday night, and the last batch of news, which left on Tuesday 28 arrived between three and four o'clock on the Friday morning. Brice would then have two to four hours to select, edit, compose, print and put on sale that morning's issue. At times there were delays and interruptions; on 25 January 1717 Bliss's Protestant mercury was rather short on news because, as the printer explained: "The post boy being robb'd of his mail between London and Staines, there was no news or letters come in by last night's post." Generally though the printer had communication from London three times a week. Secondly printers required a regular supply of paper. In 1711 there were four paper mills in Devon, only one of them in Exeter, so Farley and Bliss may well have ensured a reliable supply by using a London wholesale stationer (Shorter 1957, 152-9). From 1712, when Stamp Duty was imposed, the only source of supply was the London warehouse of the Commissioner of Stamps. Beside this it was necessary to return unsold papers to the Stamp Office in Lincoln's Inn Field to reclaim a rebate on the stamps (Wiles 1965, 103). Delays in supplies were especially irksome when printers had to pay for stamped paper in advance. Joseph Bliss, the printer of the Protestant mercury clearly had problems over paper quality and announced in 1716: "By reason many complaints have been made of the badness of my paper, which makes the print appear the worse, and most persons that buy my news being rather inclin'd to pay the price for better ... this is therefore to give notice that next week I shall print on very fine paper, price single three half-pence; but to those who take it quarterly at the rate of 10s per annum." The coarse paper issue cost one penny. This regular use of large quantities of paper required a reliable carrier service between the London wholesale stationer and the Exeter printer, a service that could carry consignments of books as well as bales of paper. Thirdly printers needed London agents to take in advertisements, and it soon became apparent that the people placing advertisements would need to have details and preferably be able to see copies of the newspapers they were paying two shillings or more to advertise in. Thus the imprint of Trewman's Exeter flying post of May 1772 includes the statement: "This paper may be seen every week at the Chapter Coffee-house, Paternoster-row, Paul's Coffee-house, St. Paul's Church-yard (where it is separately fil'd), Peel's Coffee-house, Fleet Street, Mr. Branscombe's Lottery-office, Holborn, London; and at the Parade Coffee-house at Bath." We are also informed that: "Advertisements are also taken in at Mr. Branscombe's Lottery-office, no. 5 below the Bars, Holborn, and Mr. J. Cooke, bookseller, in Paternoster-row." The despatching of copies to London coffee houses had been a regular practice since at least the 1750s with west country newspaper publishers, and advertisers whose products were distributed widely would welcome the publicity afforded by a network of provincial newspapers whose printers could also act as agents for their products. The range of such products was rather limited. Beside the lottery tickets which Trewman sold in 1772, and on which he presumably earned commission, there were two main categories of branded goods: patent medicines and books. Apart from public announcements, and insurance companies with lists of local agents, these were the predominant non-local advertisements appearing in the 18th century provincial press. Thus in the 18th century the provincial newspaper was more than a four-page news sheet with its contents cribbed from the London papers plus a few local advertisements for runaway apprentices and lost watches. It was the centre of a communications network which now supplied to many remote areas a regular and speedy link with the rest of the world where previously any links had been spasmodic and slow. The distribution of newspapers will be discussed in more detail later. The circulation of these early provincial newspapers is difficult to assess. From 1712 to 1725 most newspapers consisted of 1½ sheets as this qualified them as a pamphlet liable to pay only three shillings stamp duty for an entire impression instead of one penny for every whole sheet in an edition or a half penny for every half sheet. When this loophole was blocked in 1725 Andrew Brice announced in the April 23 issue of The postmaster that he would have to pay annually an additional £100 or more in duty. This indicates a circulation of at least 24,000 sheets per year or 300 1½ sheet newspapers per week. Prior to the change in the law on stamp duty the newspaper cost 1½d per issue, afterwards the price rose to 2d for the newspaper which the disgruntled Andrew Brice revived under the new title of Brice's weekly journal on 30 April with four two-column pages on a single sheet. The progressive rises in newspaper stamp duty to a minimum of 1d in 1761, 1½d in 1776, 2d in 1789, 2½d in 1794 and 3½d in 1797, together with the rising price of paper, resulted in a charge of 6d for a newspaper by the end of the century. The wages of an Exeter labourer rose from about six shillings and nine pence in 1700 to eight shillings a week during the second half of the century while a craftsman's wages rose from ten shillings a week in 1710 to twelve shillings in 1790. It can be calculated that the cost of a four page weekly newspaper in the 1790s might be the equivalent of perhaps £5.00 in today's prices. By 1793 the printer of the Exeter gazette boasted a circulation of about 1,000 copies, not dramatically more than Brice could have achieved seventy years previously. Where they could get them people had a preference for London papers whose news was that much fresher. However, the print run of London newspapers was not large enough to satisfy provincial demand across the whole country, so that the printers in provincial towns acted as relay posts, multiplying the numbers of copies for local distribution and adding local advertisements. Such work could occupy a press for one day a week and would still leave time for other work. Significantly, the gathering of advertisements and other matter for inclusion in the newspaper set up communications networks which helped the production and distribution of much of the remaining output of a newspaper printer. For the first century of its life the Devon newspaper press was virtually limited to Exeter, attempts to found newspapers in Plymouth in 1718, 1759 and 1780 failing after a few years. In Exeter there were probably at least two newspapers at any one time for most of the eighteenth century although original copies survive poorly, some, such as a newspaper apparently published by Joseph Drew in the years around 1750, having disappeared entirely. In 1808 two newspapers were established in Plymouth which finally laid a secure and permanent foundation for the Plymouth newspaper press. Benefiting from the booming wartime economy and located in an important naval centre, these newspapers at times carried news of the Napoleonic campaigns before their London rivals.